When I originally applied to be a diocesan intern through the Armenian General Benevolent Union’s New York Summer Internship Program, I was not exactly sure what to expect. I thought I knew about the church already. I had been ordained a tibir (acolyte), taught Sunday School, attended Camp Vartan, and served on the executive board of my parish’s ACYOA Juniors. What I had not anticipated, however, was the scope of the diocese. With departments ranging from accounting to youth ministry, to the communications department, the Diocese bustles with activity. Where, I worried, would I fit in? The answer, I would later find out, was in the Krikor and Clara Zohrab Information Center. Here, to my delight, my responsibilities change day to day. Some days I help catalogue the many books in the Zohrab Center. Often, I can’t help but peruse the titles and sample the stories. Other days I help to organize the immense collection of books the library owns. Perhaps most intriguing, however, was when I spent time going through the photos and documents of prominent Armenians who have seen fit to leave such things to the Zohrab Center. I poured over the passports and photographs of Dolores Zohrab Liebmann and her family and inspected pictures of the artist Vava. By working at the Zohrab Center every day, I have also forged relationships with people I met through my time here. In addition to my responsibilities in the center, I have also been exposed to a great number of topics which I was not previously familiar with. This was accomplished through hour-long discussions with the staff of the Zohrab Center. The title of these sessions was “Armenia: Then and Now.” Again, even though I thought I had a solid foundation in the history of Armenia, the breadth of the topics we covered astounded me. I never anticipated that by studying Armenian history, one was really studying the history of the world. We discussed Armenians in the Ottoman Empire and their immense contributions to society, Armenians in Venice, in particular the Mekhitarist monks and the island of San Lazzaro. The island, we discovered, was a center of Armenian printing and literature. Although pledging their allegiance to the Roman Catholic pope, the Mekhitarist monks focused their efforts on a renaissance of Armenian literature. And, to this day, the island still belongs to this Armenian monastic order. We also watched a video “Everyone Prays at Holy Etchmiadzin” which traces the history and importance of the Armenian Church. Another session involved a trip to the Metropolitan Museum of Art, specifically the Byzantine collection and the newly acquired Armenian khatchkar. We spoke about how even though Byzantine art was strongly influenced by both Armenian and European art, khatchkars were an art form which was solely Armenian. We also viewed coins that depicted great leaders of the Byzantine Empire, some of whom were Armenian. We learned that coins were a major way citizens could identify who their leader was. In an age before newspapers and television, the average citizen could tell who was in charge by whose face was on their coins. With roughly half of my internship completed, it seems necessary to reflect on what I have accomplished. What I have found, it seems, is that Armenians share a marvelous history of success. Thriving in nearly every aspect of world history, it seems to be a tradition continued even today. The AGBU New York Summer Internship Program attests to this fact. Drawn from all over the world, greatly varied in interests and occupations, the thirty four of us are representative of the successful nature of Armenians. Among us are future doctors, lawyers, writers, hedge fund managers, engineers, and architects, and we hope to preserve our Armenian heritage and culture and build on the strong foundation the preceding generations of Armenians created here in the United States. Wow, congratulations Nick! This was a really great article. It seems like the Zohrab Center is really lucky to have you as an intern! I wish I could address the Blogger by name, unless I missed it, but I was so delighted to read what he had to say. I have no doubt that spending time in the ZC must be an amazing journey, as well as an adventure, into territories that many Armenians have yet to learn about. Please do keep us posted on some of your findings as I am certain they will be of great value to many who wish to learn about Armenians and Armenian history. Happy Investigating. I see that the blogger’s name was in the Title of the message…Thank you Nicholas! Wow what an interesting and insightful article!!! I’ve been to the diocese several times and never even knew the Zohrab Center existed until I read this article, now I’ll be sure to visit. Great job. 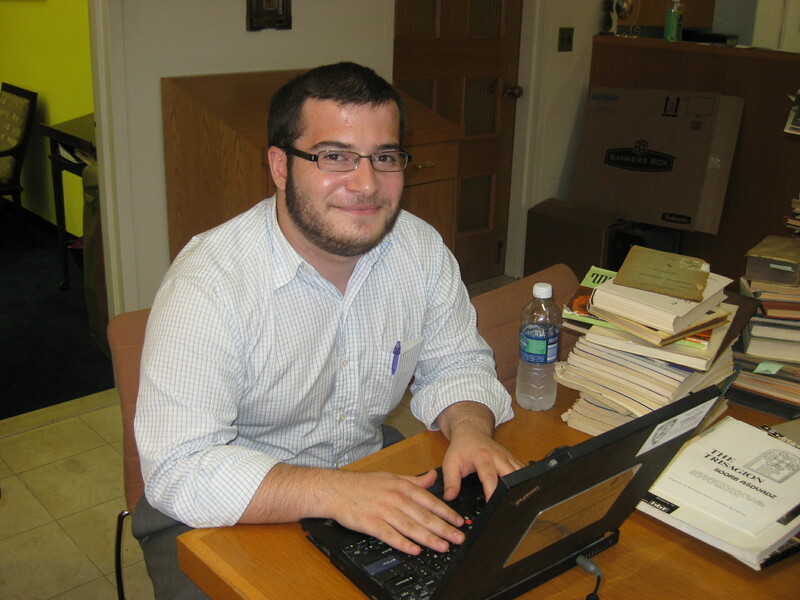 The Zohrab Center IS lucky to have Nick as an intern. What a beautifully written article. Mr. Nick seems like a very insightful and intelligent individual, perhaps he should work at the zohrab center full-time. ‘Sampling’ books seems like fun. Wonderfully written Nicholas. Your Dad, brothers and I are all so proud of you! Congratulations, Nick, on this diverse experience! I don’t know you, but I’m proud of you…anyway!! Abreese!